It looks like one of those plastic parts trees from a model kit, but this is Ayrton Senna's 1991 F1 championship-winning McLaren MP4/6, deconstructed and transformed into a wall sculpture back in the '90s. Now the art piece is up for auction. The story of how this creation of UK artist Jay Burridge was endorsed personally by McLaren's Ron Dennis is indeed one for any art-student's "how to make it big" handbook. Burridge was a sculpture student at London's Central Saint Martin's college of Art and Design in 1992, when McLaren tendered an offer for one student to create a sculpture out of one of its racecars. After being shown a car from the previous season being dismantled, Burridge got the idea for the model-kit theme. He quickly drew up plans, which Dennis personally approved. After initial showings, the piece found a temporary home in the London offices of then-sponsor Marlboro's advertising agency. The sculpture was in storage in 1994, when Senna was killed, and Ron Dennis called Burridge to ask if it could remain there for two years. 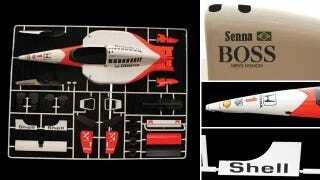 Burridge indeed kept the piece off the market out of respect, refusing to profit from Senna's death. Later, McLaren cleaned and restored the body work so the piece could be used for a tribute to Senna at the 2004 Goodwood Festival of Speed. If you look carefully, you'll notice an omission of the original Marlboro sponsor decals. In their place are the "strobe" decals (also used that year, after the cigarette advertising ban). The sculpture is to be sold by the International Car auctioneers COYS at their Nurburgring sale in Germany on August 13th. Auction organizers expect the piece to bring in between $50,000 and $60,000.